The diameter of the intestine of birds hardly varies throughout its total length which makes an exact lining in sections difficult. 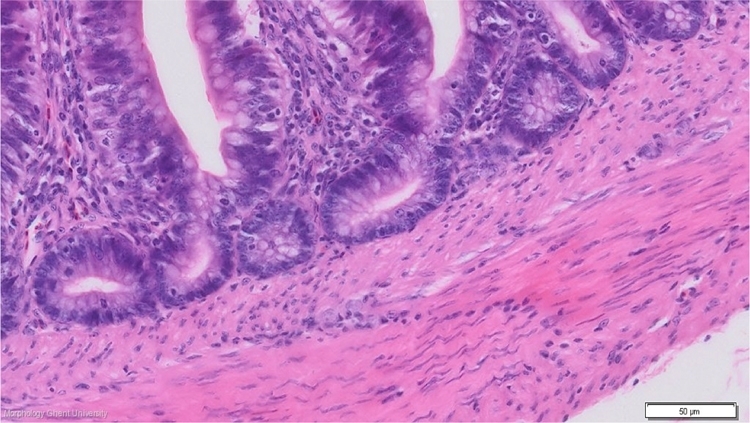 The structure of the small intestine is similar in all its sections, with a decrease of the height of the villi and a decrease of the depth of the crypts of Lieberkuhn from the duodenum to the ileum. The T. submucosa is extremely thin and doesn't contain glands in the duodenum. The l. muscularis mucosae is rather well developed, having the same thickness as the outer longitudinal layer of the T. muscularis.